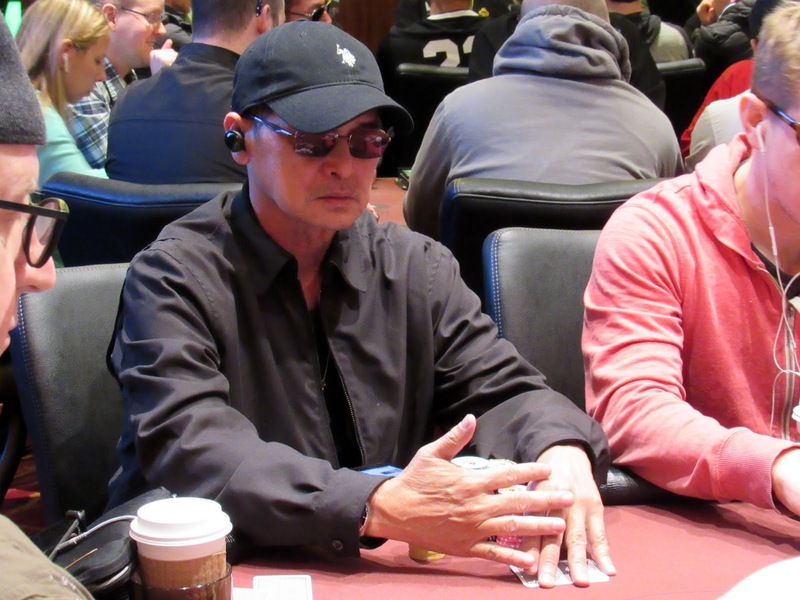 From late position, Paul Nguyen moves all in for around 375,000 and action folds to William Derego in the big blind. William is sitting on a covered stack of under 300,000 and elects to make the call with [Ad][Kd]. It's a flip, but Paul has the advantage with his [4s][4d]. The [Kc][2h][As] flop gives William a 90% chance to win the hand and survive. The [2d] further increases his lead, but the unlikely [4c] on the river has the table explode with excitement. The stacks are counted down to confirm that William Derego has indeed been eliminated. He gives Paul a congratulatory fistbump and headed to the cage to collect his $5,345 payout. 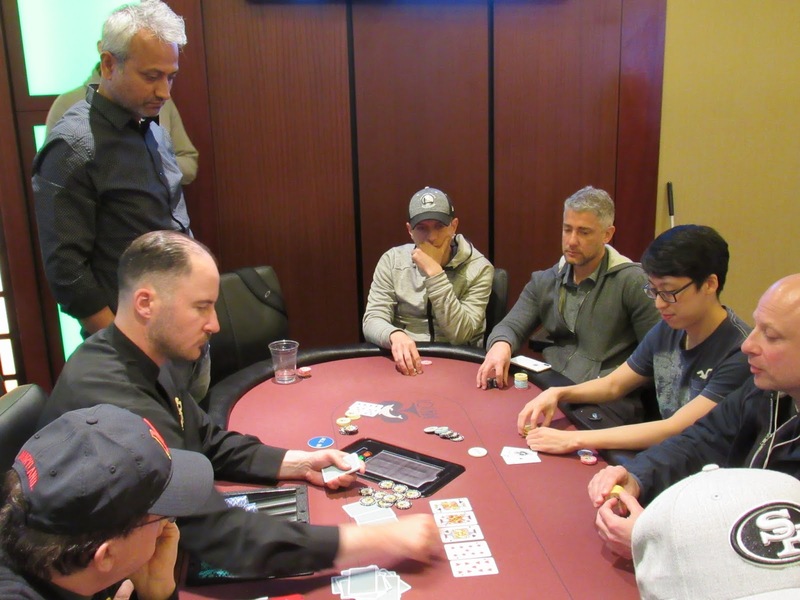 Andrew Lok moves all in preflop for 195,000 from the button, and Paul Nguyen calls to cover him from the small blind. The two players then flip over their cards. Lok doubles up to survive with 440,000, and Nguyen holds 300,000 after the hand. The players are taking another 10-minute break. 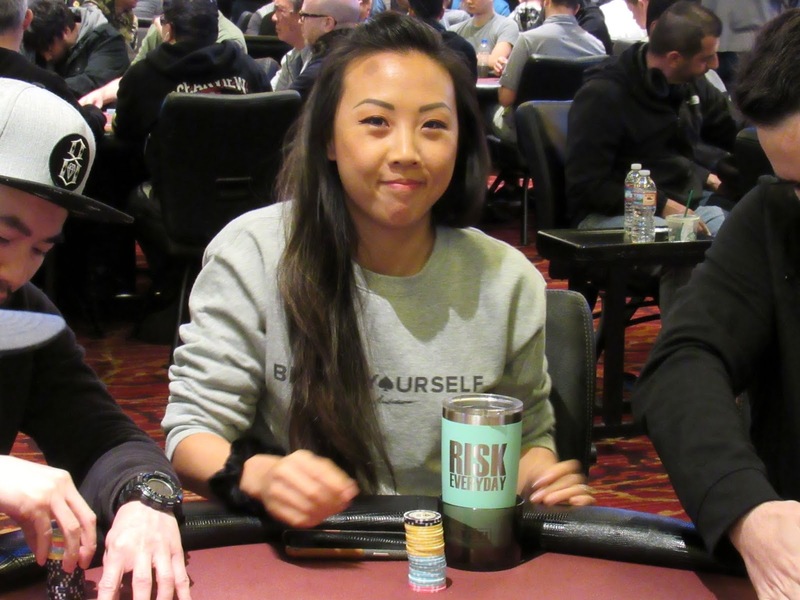 Neng Lee raises to 45,000 preflop under the gun, and Christopher Tham reraises all in for 300,000 on the button. Lee calls to cover him so they flip over their cards. Tham is eliminated in 15th place, good for $5,345, and Lee is up to 900,000. Jeffrey Griffiths (pictured) moves all in for 230,000 preflop on the button, and Tuiofu Hunkin calls to cover him on the big blind. The two players then flip over their cards. 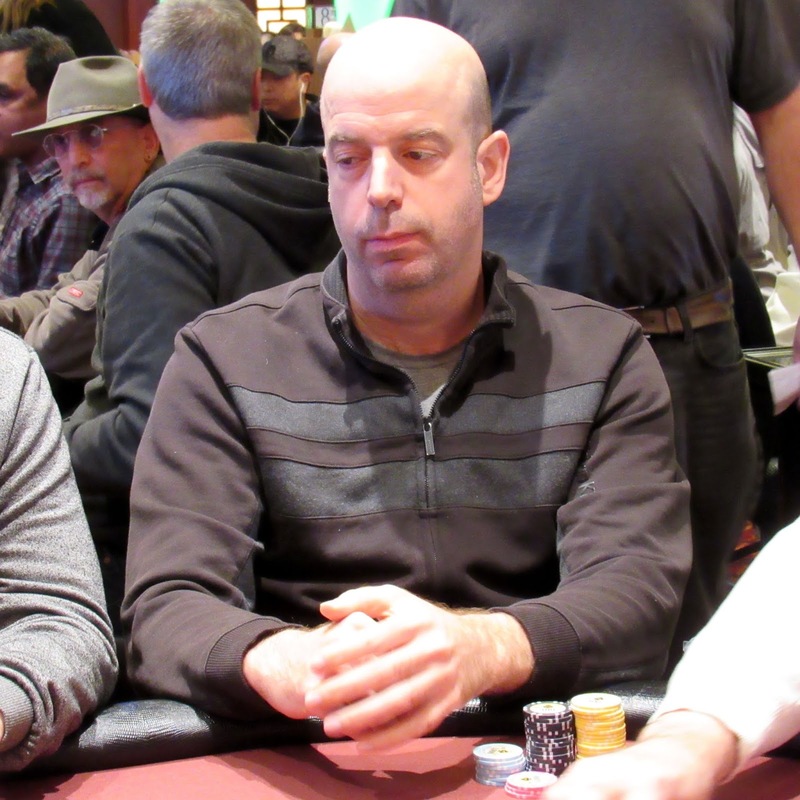 Griffiths is eliminated in 16th place, good for $4,405, and Hunkin stacks up 545,000 after collecting the pot. 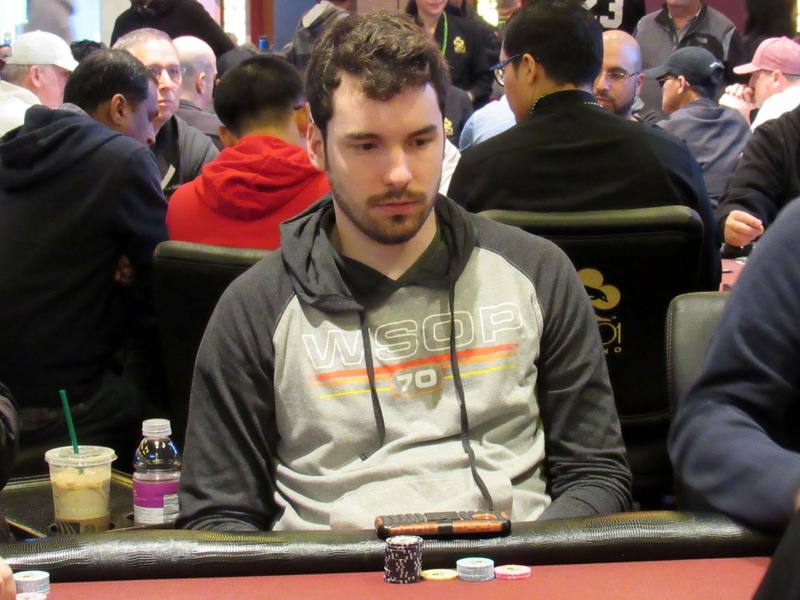 Jeffrey Griffiths raises to to 200,000 preflop from the cutoff, and Alberto Acosta calls all in for 45,000 on the big blind. The two players then flip over their cards. Griffiths hits a straight on the river to grow his stack to 280,000, and Acosta is eliminated in 18th place, good for $4,405 in prize money. 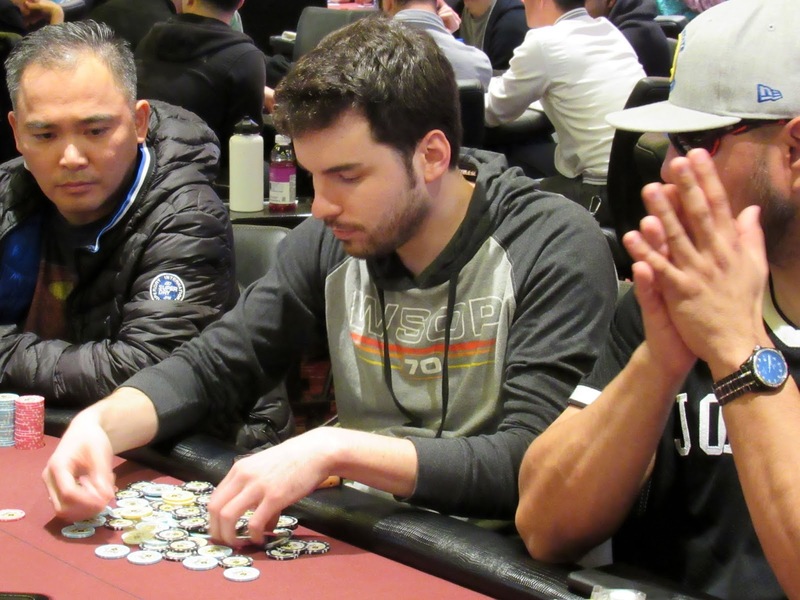 There is 210,000 in the pot, and the flop reads [9c][8h][5c] when Andrew Lok moves all in for 120,000 from the big blind. UTG tanks for a moment before calling. The two players then flip over the cards. Lok doubles up to survive with 450,000 after collecting the pot. Andres Tamberg is all in with [6c][6s] in the hole under the gun, and Triet Nguyen has him covered with [5c][5s] in the hole on the cutoff. 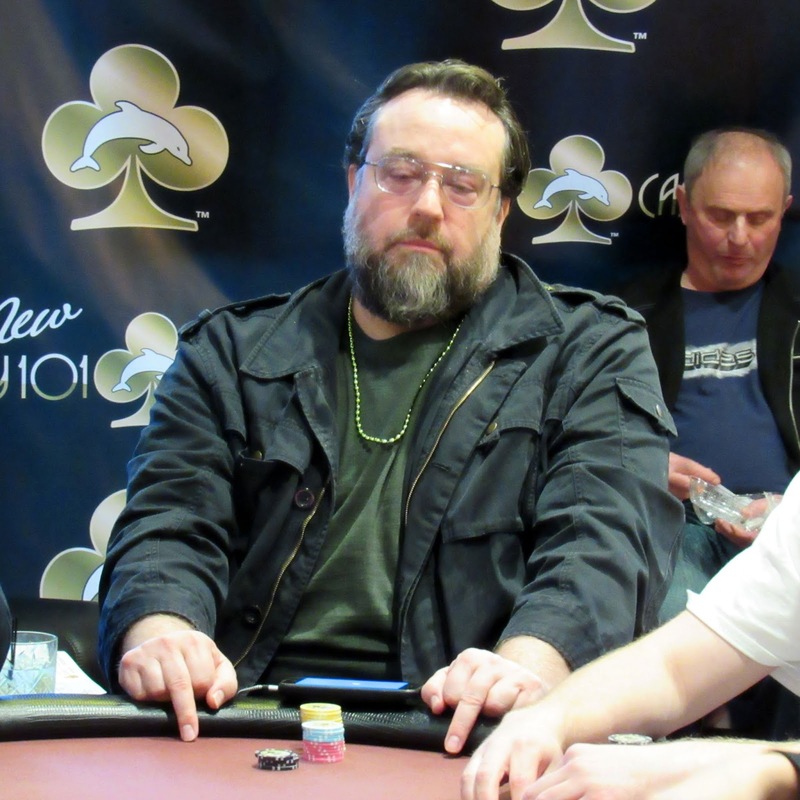 The board is dealt [10c][5d][3c][7s][Jd], and Ramberg is eliminated in 31st place, good for $2,175 in prize money. 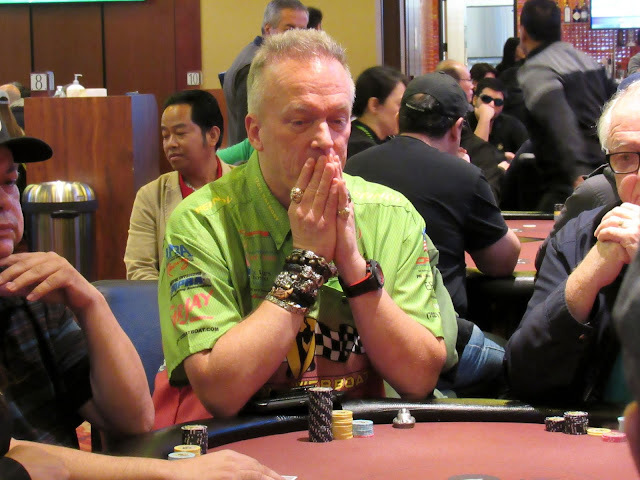 Steven Tabb was maintaining an average stack when he ran into the classic race, taking his ace-king against his opponent's pocket queens. The board ran out with no ace or king, and the river fell another queen to add insult to injury. Steven shipped most of his stack over and a few hands later he pushed his five blinds in with king-five. 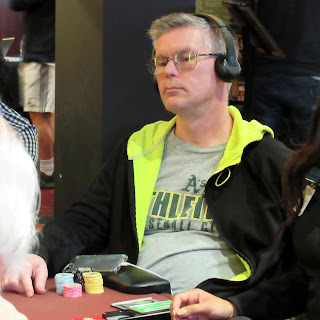 A player called with pocket nines, and the K-9-X flop left Steven in bad shape. 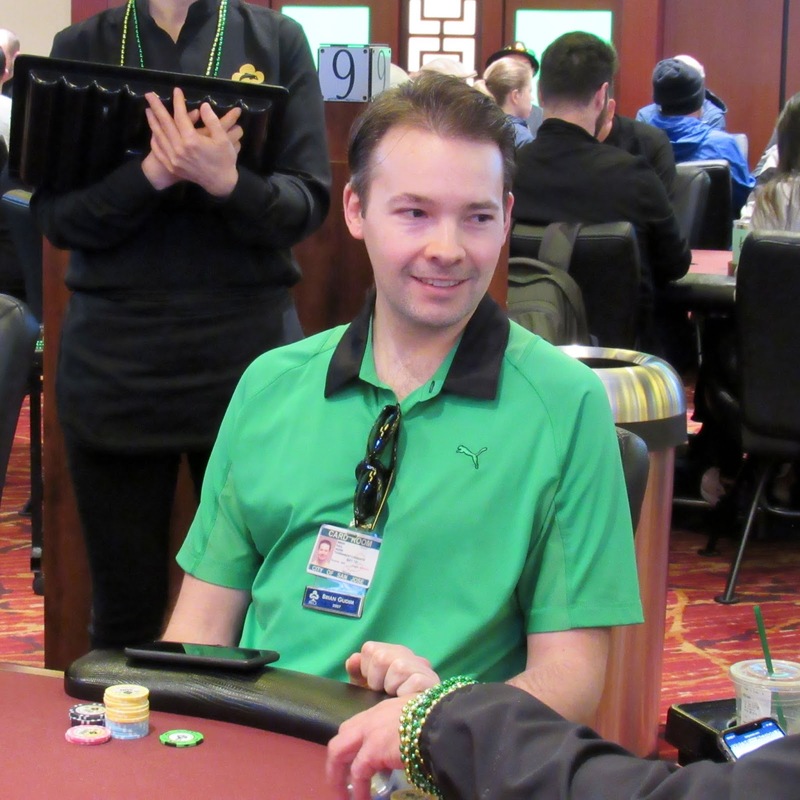 No miracle came, so Steven exited the tournament in 33rd place, good for $2,175. He plans to take tomorrow off and come back rested for the Main Event on Tuesday. Chris Koo moves all in preflop for 57,000 UTG+1, and the hijack calls to cover him. Everyone else folds so they flip over their cards. Koo hits two-pair on the river to survive with 134,000 after collecting the pot. 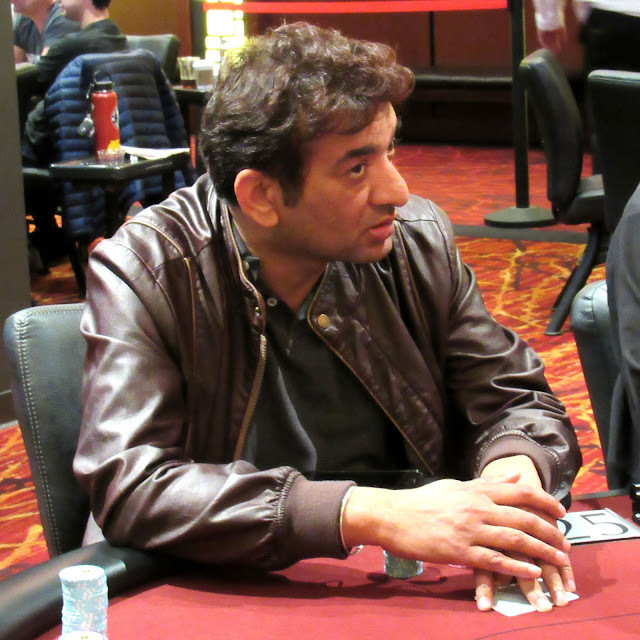 Rajesh Saina is all in preflop for 44,000 UTG+1 with [As][10c] in the hole, and the big blind has him covered holding [Kd][Qd]. The board runs out [Jd][8c][6h][7s][Jc], and Saini doubles up to survive with just over 100,000. 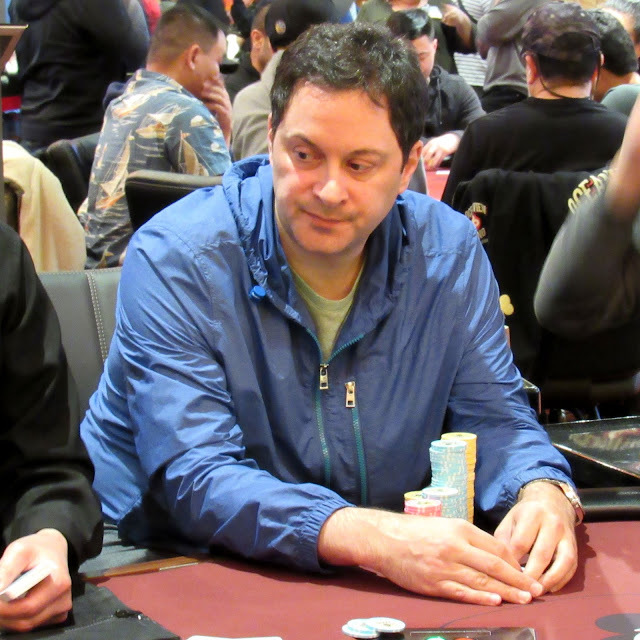 The cutoff is all in preflop with [Ks][Kc] in the hole, and Dan Sepiol has him covered holding [Ac][Js] on the big blind. 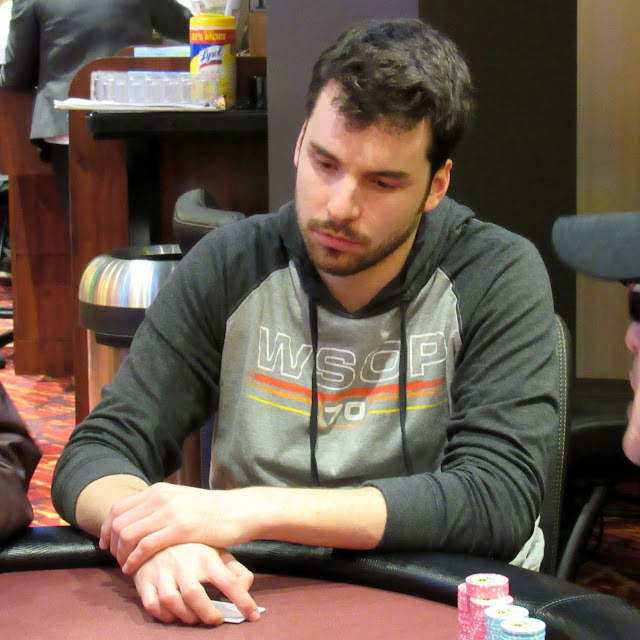 The board is dealt [Ah][7d][4h][2s][Qc], and Sepiol wins the pot to grow his stack to 335,000. 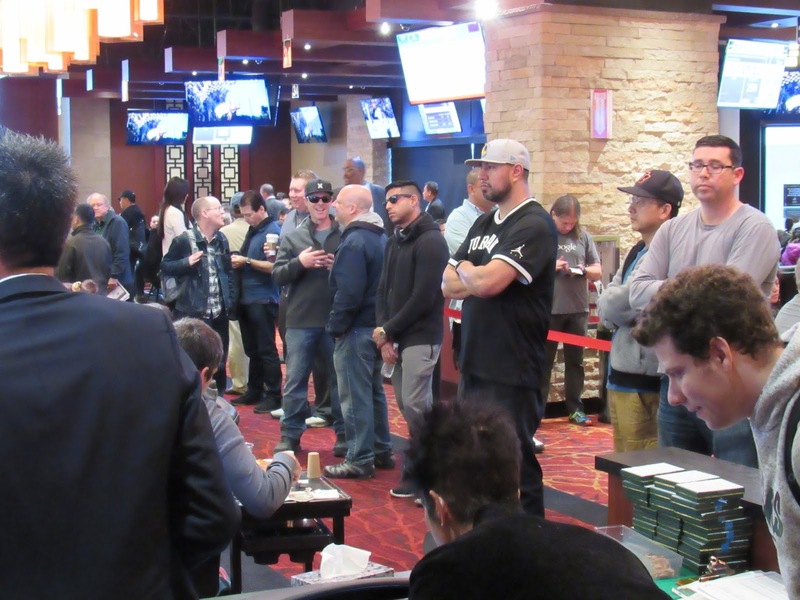 The money bubble has burst, and every players remaining will take home at least $1,800 in prize money. 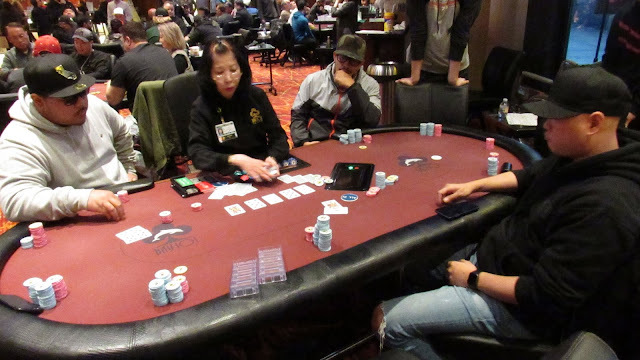 The big blind is all in preflop with [As][Kc] in the hole, and Chris Koo has him covered holding [Ah][Ac] from the hijack. The board hits the table [Qh][8c][2c][3h][10d], and the big blind is eliminated on the hand. Koo stacks up 300,000 after the hand. A player in middle position is all in preflop with [4d][4h] in the hole, and Bill Derego has him covered holding [Qh][10h] on the big blind. The board is dealt [10s][6s][4s][10c][Ah], and Derego stacks up 260,000 after collecting the pot. On the last hand before break, Tuiofu Hunkin was in a race with [Ts][Tc] against his opponent's [Ah][Kd]. The board ran out pure to give Tuiofu almost a double-up, eliminating his opponent and trimming the field to 55 players. As the field goes to break, all remaining tables are now 9-handed except for one 10-handed table. 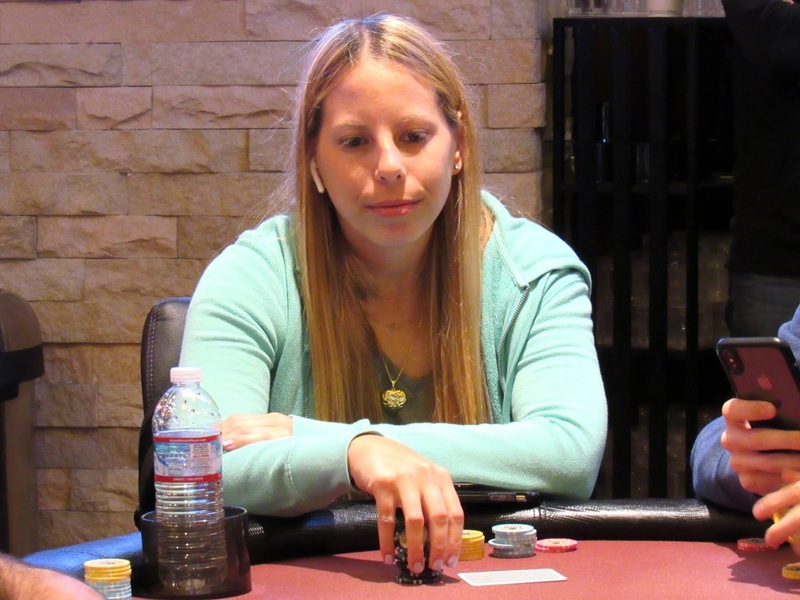 Recent eliminations include Kristy Arnett (pictured), Adam Duong, and Noel Rodriguez as the money bubble approaches on Day 1. Action continues to fly as the blinds continue to rise. Joe Ranciato is all in preflop with [Ac][Qd] in the hole from the hijack, and his opponent has him covered holding [6d][6c] in late position. The board runs out [Ks][4c][2h][5c][Js], and Ranciato is eliminated on the hand. UTG+1 is all in for about 20,000, and Alex Yi has him covered on the big blind. Here is a look at their cards. UTG+1 is eliminated, and Yi stacks up 70,000 after collecting the pot. Kelly Minkin is no longer in the field. Here is a look at the notable chip counts in the field. Joe Ranciato is all in preflop on a short stack with [Ad][5s] in the hole, and his opponent has him covered holding [Kh][10h]. 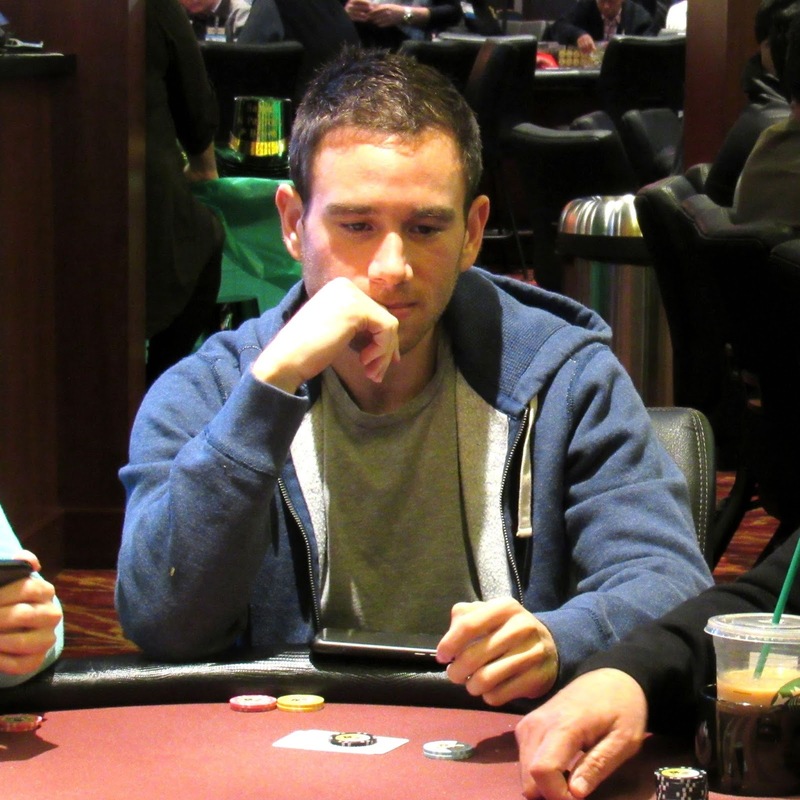 The board is dealt [Ah][Qh][8d][3s][Qs], and Ranciato doubles up to survive with 18,000. The players are taking a 10-minute break. A middle position player raised to 4,000 and Steven Tabb called as did the big blind. The three players saw a [Tc][3d][Qc] flop, and the original raiser continued for 9,000. Steven called once again, but the big blind folded. On the [5h] turn, the original raiser bet 20,000, slightly less than what Steven had behind. Steven moved all in for his remaining 22,000 or so, which was quickly called. Steven tabled [Qh][Th] and the original raiser said nice hand as he showed his [As][Qd]. He would need one of the three remaining aces to eliminate Steven, but the [8c] wasn't it. Steven doubled up to approximately 78,000 just a few minutes before break. Recent eliminations on Day 1 include Pat Lyons, Debbi Hinton, and Todd Brunson (pictured). 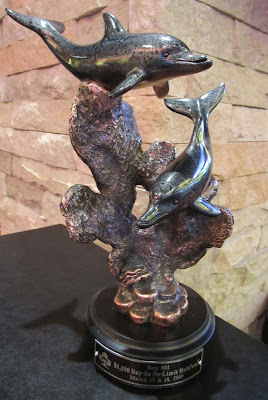 UTG+1 moves all in preflop for a little less than 20,000, and Art Bisque reraises all in over the top of him. Everyone else folds so they flip over their cards. UTG+1 is eliminated, and Bisque stacks up 81,000 after the hand. Jimmy Zeledon (pictured) raises to 3,600 preflop on the cutoff, Pat Lyons calls on the button, and the big blind reraises all in. Zeledon reraises all in over the top of him, and Lyons folds. The two remaining players then reveal their cards. The big blind is eliminated, and Zeledon stacks yup 81,000 after collecting the pot. 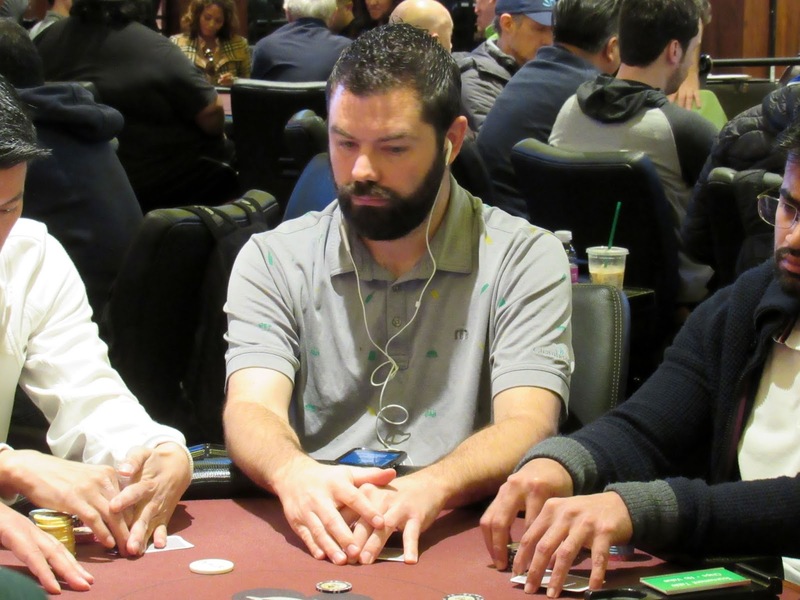 Here is a look at the notable stacks in the field on Day 1 in the $1,000 preliminary event. Donald Landwirth is all in preflop on a short stack from the small blind, and UTG+1 has him covered. The two players then flip over their cards. Landwirth doubles up to survive with 18,400 after collecting the pot. 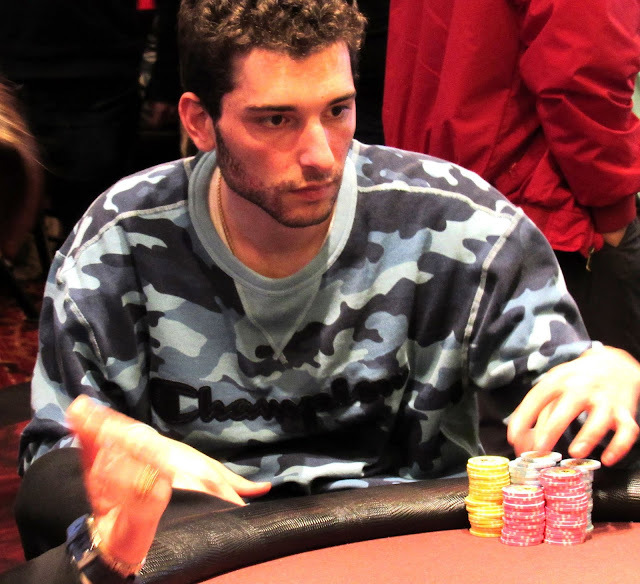 Recently eliminated players include Alex Greenblatt (pictured) and Kristina Holst early on Day 1. Debbi Hinton had previously been up to almost 100,000, but a recent visit to her table showed her down to 43,600. 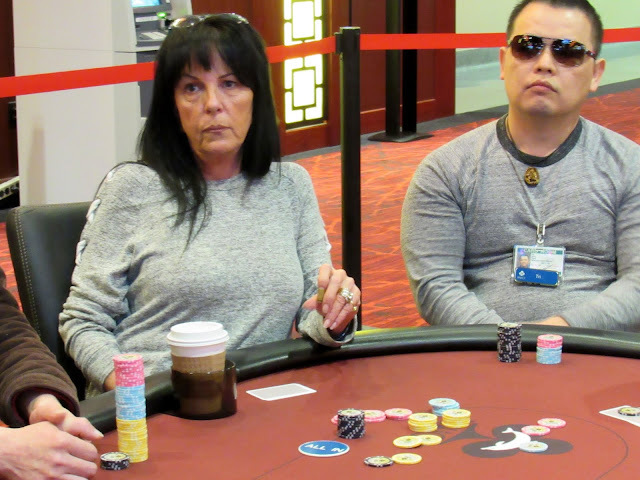 She limped into a pot with two others to see the flop fall [Qh][9h][Kd]. The big blind led out for an undetermined amount, which Debbi flat called. 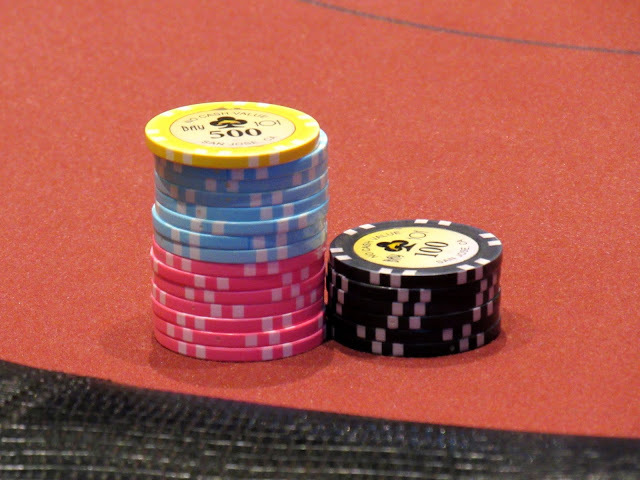 Two seats over, a player raised to 11,000, prompting the big blind to 3-bet to 27,600. Debbi moved in for her last 42,600, putting the decision back on the raiser. He took his time folding his hand before the big blind called the remaining chips, proudly tabling [Jh][Td] for the flopped nots. 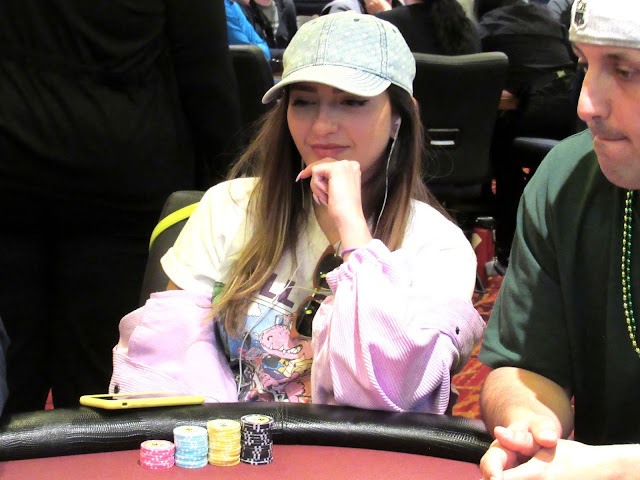 Debbi was live, however, with her [Kh][6h] for top pair and a flush draw. The raiser said he folded top two pair, lowering Debbi's odds slightly. The [8s] turn changed nothing but the [7h] on the river meant Debbi completed her flush, bringing her back up to a top stack of 100,700. The big blind is all in preflop for 17,700, and Paul Nguyen has him covered UTG+1. Here is a look at their cards. 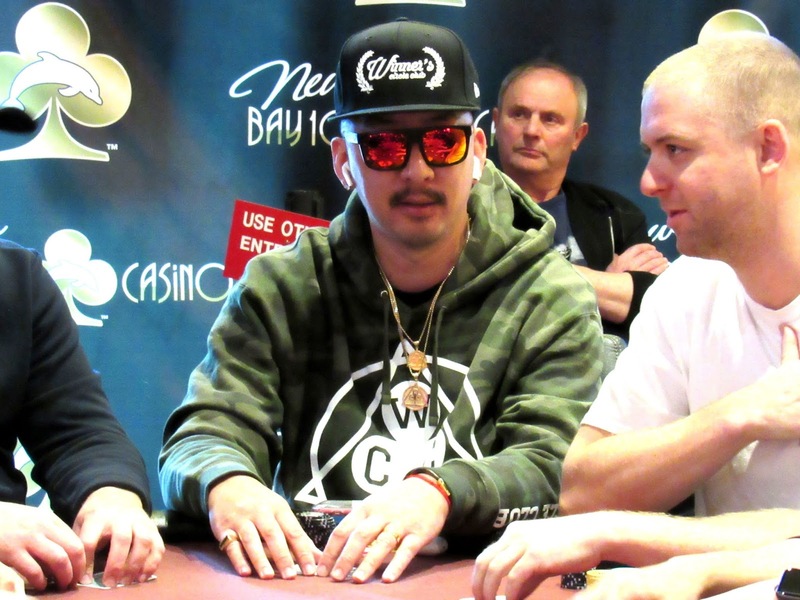 The big blind is eliminated, and Nguyen stacks up 117,300 after collecting the pot. 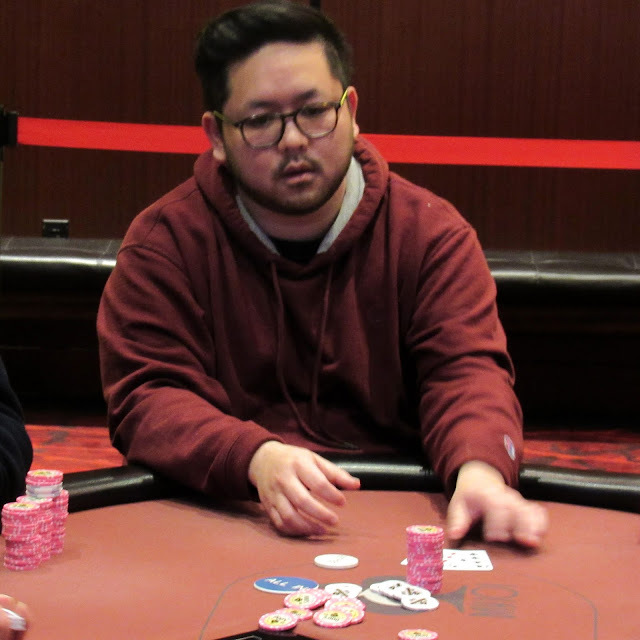 Recent eliminations early on Day 1 at the $1,000 preliminary tournament include a couple of local Bay Area players in Joe Nguyen (pictured), Ian Steinman, and Sean Marshall. UTG moves all in preflop for 5,500, and Ralph Topete reraises all in over the top of him from late position. Everyone else folds so the two remaining players reveal their cards. 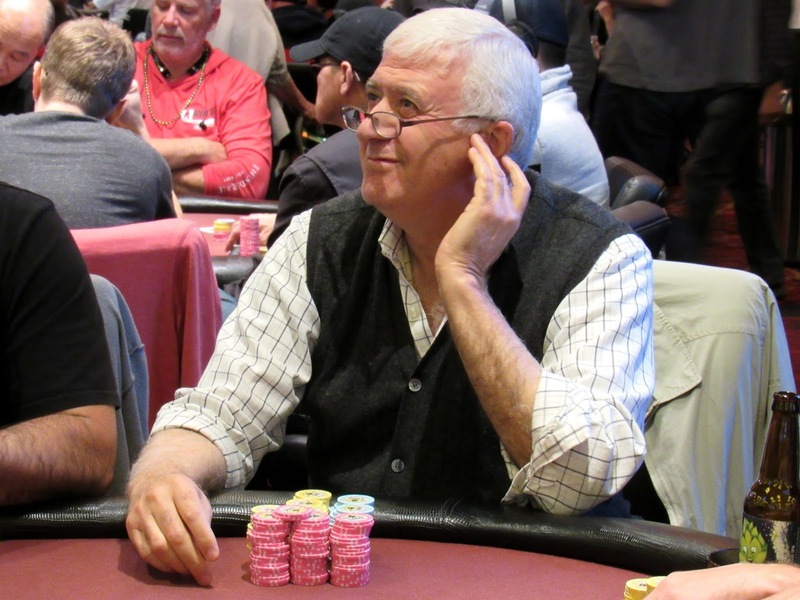 UTG is eliminated on the hand, and Topete stacks up 16,500 after collecting the pot. 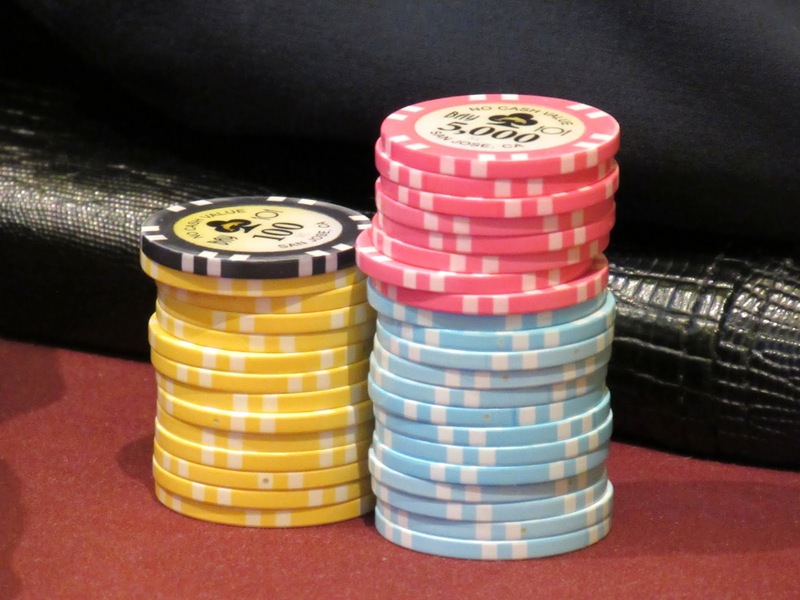 Here is a look at some of the notable chip stacks in the field. The middle position player stands up as his fate is all but sealed when the flop falls [Kc][Jd][Jc]. But the [9d] on the turn gave him a set, and the [9h] on the river gave him unneeded quads. 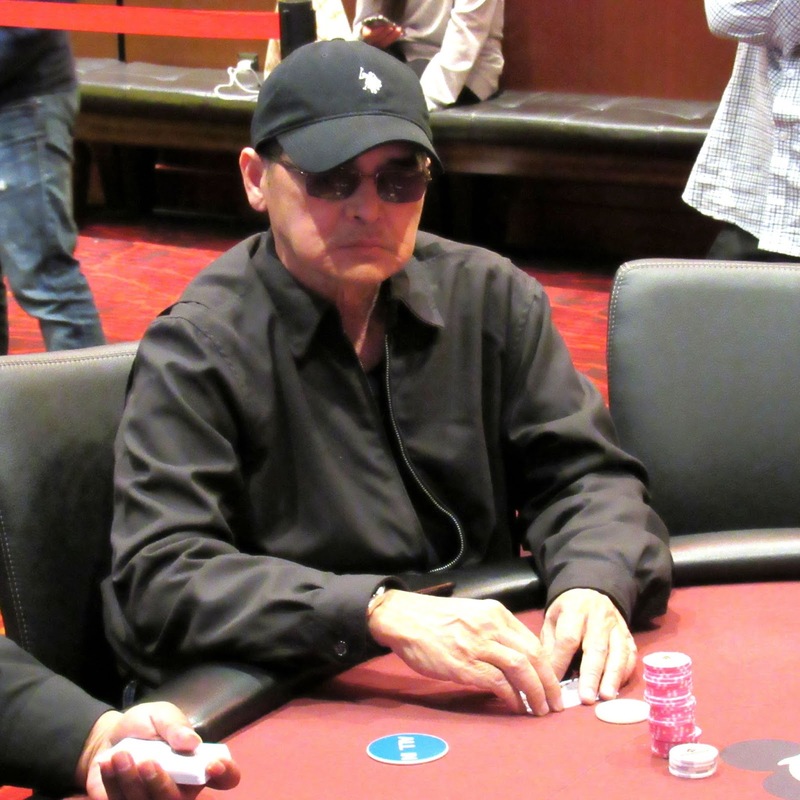 Michael Wang's aces have been cracked, knocking him down to around 19,000. Amir Lehavot raises to 1,000 preflop from middle position, late position calls, and the small blind and big blind call as well. The flop is dealt [Jh][4d][2c], Lehavot bets 1,600, and all three of his opponents fold. Lehavot stacks up 37,500 after the hand for nearly double a starting stack. Registration has closed for the $1,000 no-limit hold'em preliminary event, and there are 354 entries in the field. That number will be confirmed a little later, and the prize pool information will also be available this afternoon. There are currently 310 players seated in the field with the remaining alternates waiting to be seated. The players are taking their first 15-minute break of the day. Registration will close at the end of this break. There is 5,000 in the pot, and the flop reads [6h][4h][2d] when a player in middle position moves all in for 11,500. Levi Larsen thinks for a minute before check-calling UTG+1. The two players then flip over their cards. 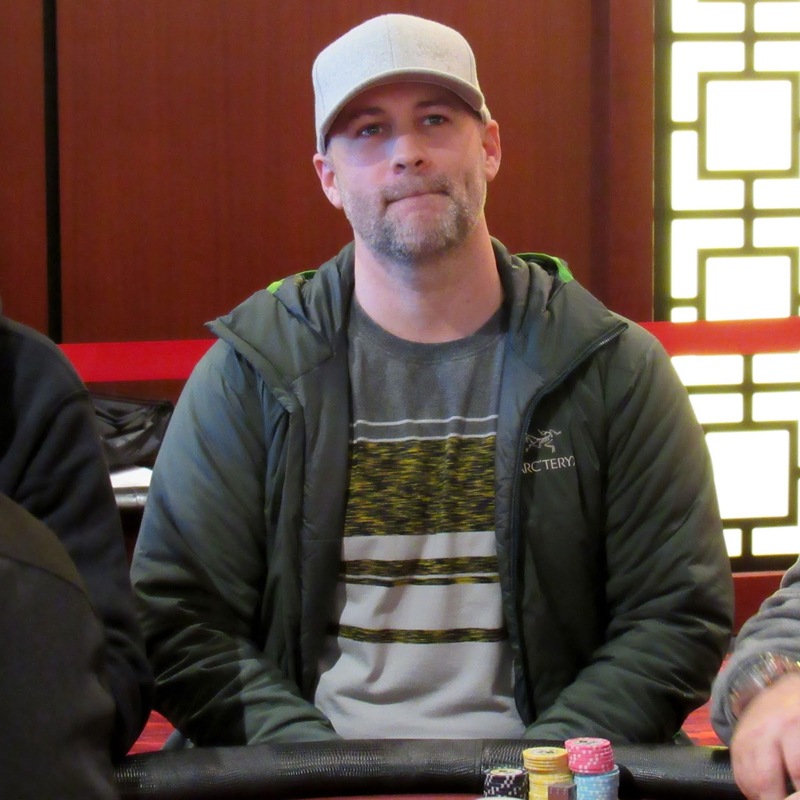 Middle position is eliminated, and Larsen stacks up 46,000 after collecting the pot thanks to a flush. 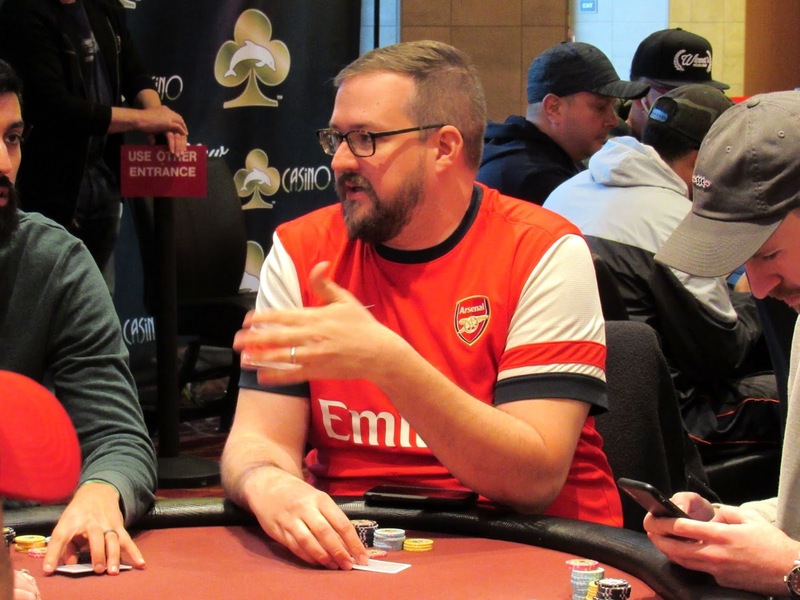 A player raises to 600 from middle position preflop, and Sean Marshall (pictured) calls on the big blind before the flop is dealt [Jd][8s][7c]. Both players check to the [5c] on the turn. The river delivers the [Jh], middle position bets 2,000, and Marshall check-calls. Marshall flips over [8c][7s], and middle position folds. Marshall stacks up 14,300 after the hand. Familiar faces in the field early on Day 1 at the $1,000 no-limit hold'em preliminary include Pat Lyons, Amir Lehavot, Neil Blumenfield, Loni Harwood, Alex Greenblatt, Brian Gudim, Kristy Arnett Moreno, Andrew Moreno, Jasthi Kumar, Kelly Minkin, Michael Wang, Tony Tran, Tyler Patterson, Mike Harvey, Adam Duong, Sean Marshall, Greg White, and Ian Steinman. Cards are in the air on Day 1 of the $1,100 no-limit hold'em preliminary tournament at the Bay 101 Shooting Star tournament series. 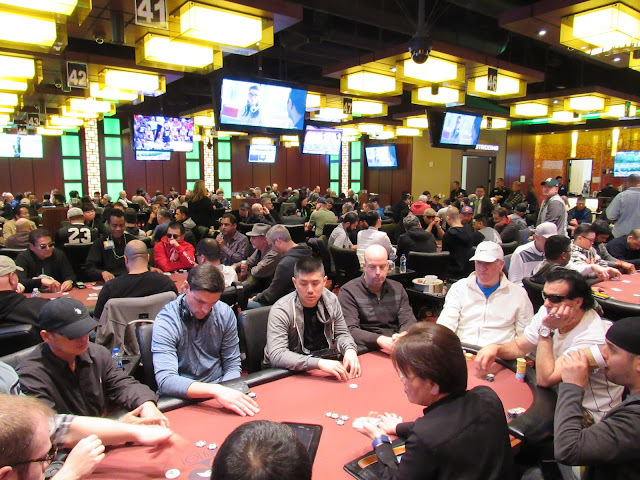 The maximum of 240 players is currently seated, with a line of alternates already forming. Blinds begin at 100-100 for the first 30-minute level of the day. 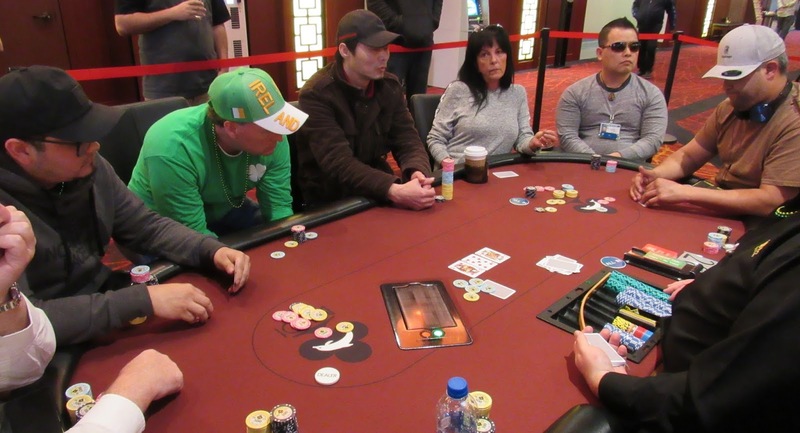 The first eight levels of play will be 30 minutes in length, and they will increase to 40 minutes from Level 9 until the final table is set. Re-entry is available until the start of Level 5 when registration will close at 12:15 pm. Play will continue tonight until the final table of nine is set.